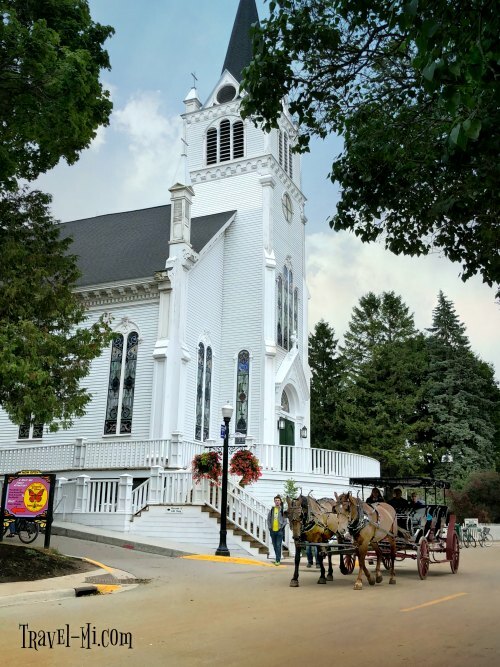 Are you wondering what to do on Mackinac Island other than eat fudge and take a horse drawn carriage ride? 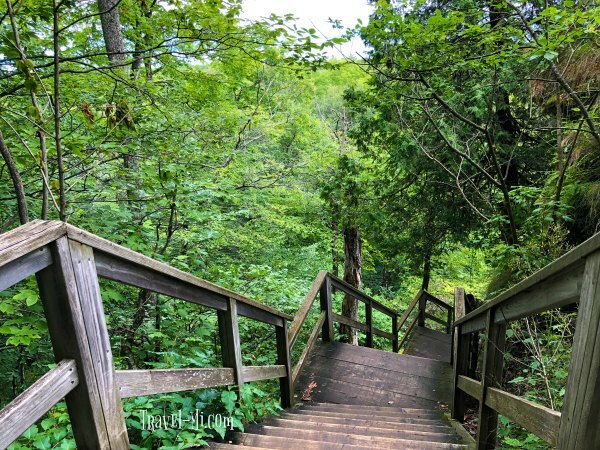 We have tons of off the beaten path activities and hidden gems for you to discover! There are also 70.5 miles of roads and trails on the Island! So be sure to either rent a bike on the Island or bring your own bike on the ferry. The cost of bringing your own bike is about a 1/4 of the price of renting for four hours so it's definitely the way to go. 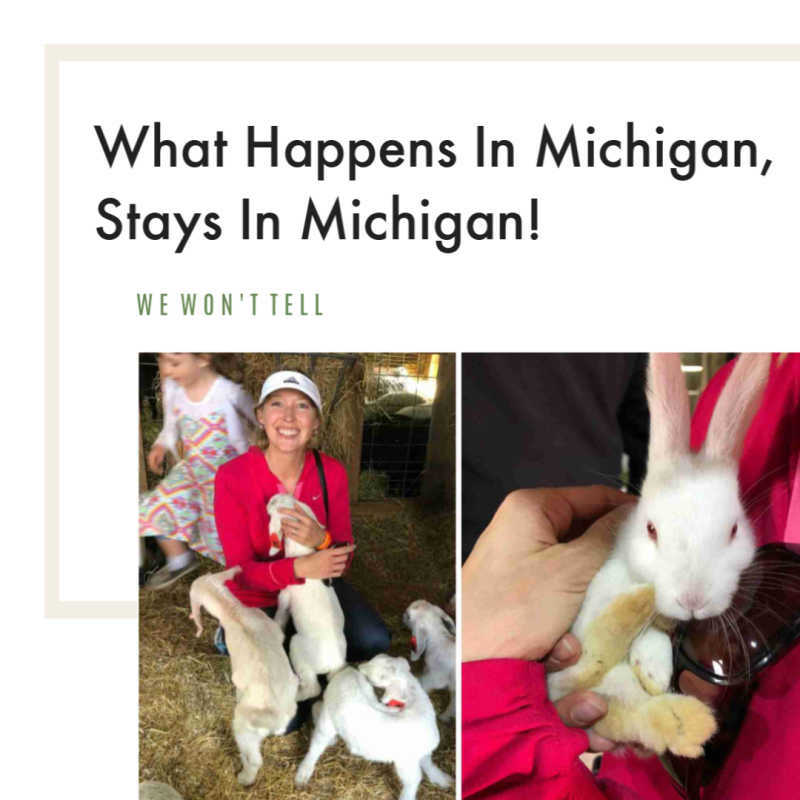 NOTE: We had so many things to do on Mackinac Island (hey, we were a little excited...) that we had to create two pages. CLICK HERE OR THE IMAGE ABOVE FOR THE FIRST PAGE. We will be starting this page with "L" or Skull Cave. Are you excited? 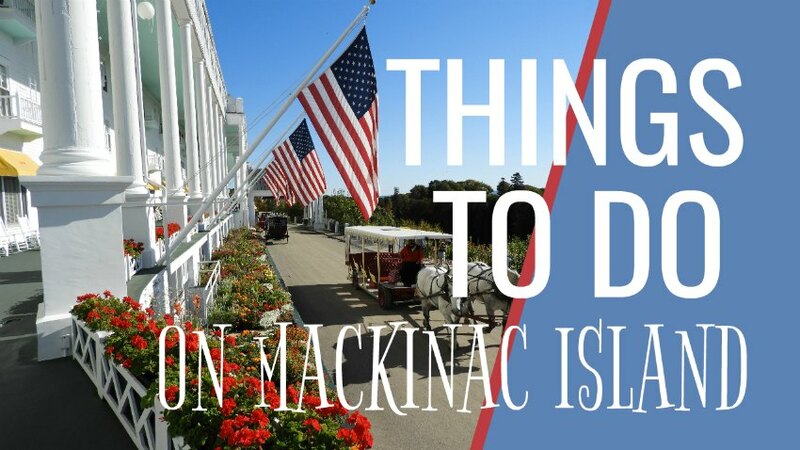 We will give you tons of ideas of what to do on Mackinac Island! What To Do On Mackinac Island So Everyone Is Happy! According to tradition, the fur trader, Alexander Henry, hid out in this cave during the Indian Uprising of 1763. Per his account, the floor of the cave was covered with human bones, presumably, Indian bones. 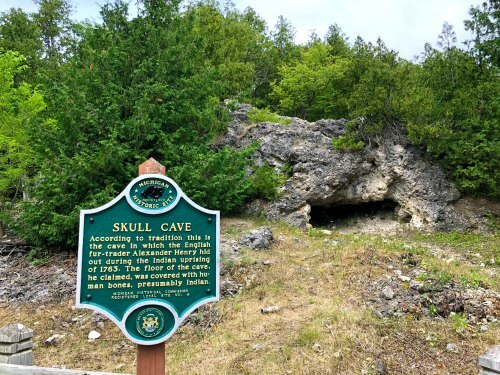 This small and shallow cave in Mackinac Island State Park once served as a Native American burial site. It's fun to look for faces on the rocks and take photos in the cave. Fort Holmes, originally named Fort George after King George III of Britain, is a small fort located 890 feet above sea level. It is constructed of earth and wood. I love the breathtaking 360-degree sweeping views of the Island and its surrounding waters. It doesn’t take long to realize why the British used it as a lookout. TIP: Use your iPhone on its panoramic setting to capture some stunning vistas! Visiting Fort Holmes also provides a unique view of the Mighty Mackinac Bridge. You can then show your friends what to do on Mackinac Island other than fudge and carriage rides...not that there's anything wrong with that. Sugar Loaf is a 75-foot-high landlocked rock or stack in the interior of Mackinac Island in Lake Huron. If you wish to get up close and personal with the rock, you can descend these stairs (to the left of Lookout Point). Honestly, we just stayed at the lookout as we had biked over 10 miles and was pretty exhausted by this point!! The true “hidden gem” aspect of Sugar Loaf Rock is the nearby Point Lookout. It’s one of the higher points on the Island and provides a stunning view of the rock, trees and miles of sparking blue water. The color contrast is unbelievable and you’ll find yourself mesmerized by the beauty. 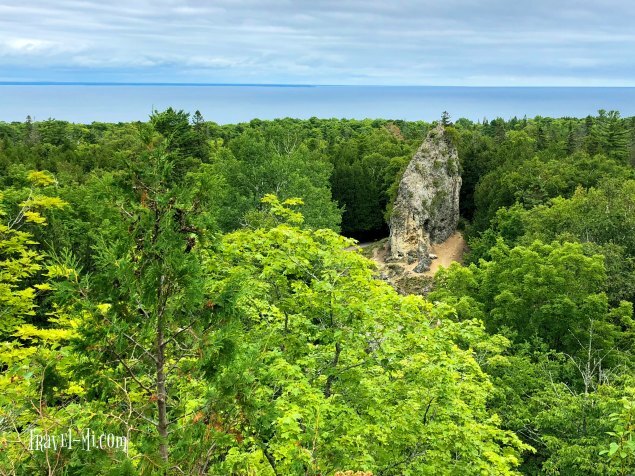 If you are wondering what to do on Mackinac Island, Sugar Loaf Rock and Point Look Out should be on your list! Arch Rock is a stunning natural rock formation with a fifty foot span at the widest point! Water and wind slowly dissolved the limestone rock leaving only the breccia rock in the form of an arch. SO, there are 207 steps to the top. You still gotta do it. 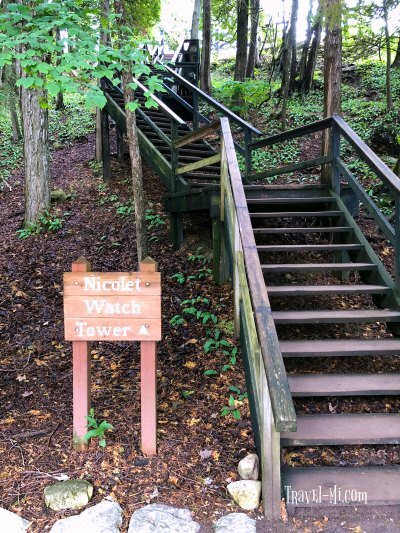 If there were 208 steps I'd say, "well, maybe you can sit this one out." But no. The views at the top are AwEsOmE. Yes. You can do it. There are landings along the way and great views so you can stop and rest. Plus, if you are wondering what to do on Mackinac Island, this is THE THING. The Arch stands 146 feet above the water level and can be reached by taking the Arch Rock Bicycle Trail, Arch Rock Road or Lake Shore Road. What an awesome natural formation. 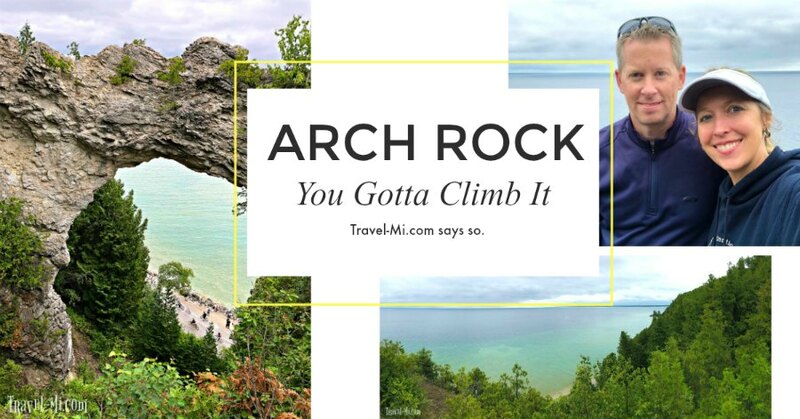 Be sure to take the time to visit Arch Rock!! Native Americans believe that the arch has many powers and they harbor several legends about it. Come check it out for yourself! 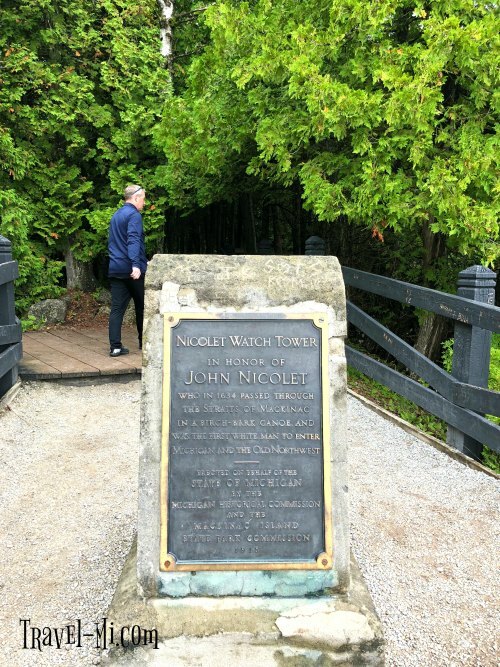 The water tower was erected in honor of John Nicolet who in 1634 passed through the Straits of Mackinac in a birch-bark canoe and was the first white man to enter Michigan and the Old Northwest. In 1909, Edwin Wood of Flint, MI, donated funds in memory of his son, Dwight Wood to make accessible and beautify the freshwater spring for the public. The springs soon became a favorite resting spot for visitors as they sipped the cool water while resting in the shade. The springs are just a few steps from the base of Arch Rock. The spring is very tiny but worth a few seconds stop. 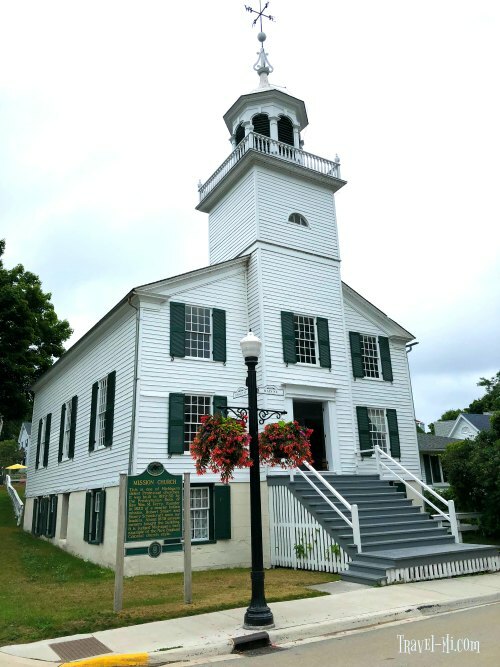 The Mission Church was a historic Congregational church located at the corner of Huron and Tuscott Streets on Mackinac Island, Michigan, United States. Built in 1829, it is the oldest surviving church in the state of Michigan. In 1971, the Mission Church was listed on the National Register of Historic Places. St. Anne's Church is older but the original building was replaced with a new structure in 1874. Sainte Anne's Church is a very beautiful Roman Catholic Church that was built in 1874 on the land donated by a former fur trader. Ste. Anne's is the oldest Catholic Church in Michigan and is designated as a Michigan historic site. The island had a historic French and Metis population before Anglo-American settlement. Its original building was replaced by a new structure in 1874, which was still used. Sainte Anne's Church is also the first church dedicated to Sainte Anne, causing quite a controversy since Dominicans did not believe that Anne was holy. The beautiful stained glass windows were installed in the 1920s replacing the original glass ones, and more stained glass windows were added in 1930. There is also a small museum in the basement of the church telling the story of the church and its past. Did You Know....The Original Mackinac Island Butterfly House is one of the oldest museums of its kind in the United States and the first in Michigan? The lush tropical garden is full of hundreds of colorful butterflies from all over the world and occupies 1800 square feet. Check out the Education Room where you can learn all about the butterfly industry. It also houses hundreds of chrysalis cases where you can observe the emergence of butterflies from the chrysalis stage. Their one-of-a-kind Insect World is a combination of fascinating, GIANT insects, both on display and live. And don’t miss the turtle pond, where you can ‘search’ for Houdini. Open until 6:00 p.m. during the popular summer months. Cost is approximately $10 per adult and $5 for children. Nobody should be complaining about what to do on Mackinac Island with the Island Butterfly House as one of your options! The Richard and Jane Manoogian Mackinac Art Museum houses a diverse collection of art styles and expressions of Mackinac inspired art. You can see hand-beaded clothes made by Native American garments, 17th and 18th century Great Lakes maps and rare decorative pieces from the Victorian period. I really liked the hand-tinted early-20th century photos by William H. Gardiner. Be sure to check out the collections of Native American Art, historic maps and photos of the island. **If you purchased tickets to the Fort, you can see this art museum free of charge. Just show your fort ticket or bar code! 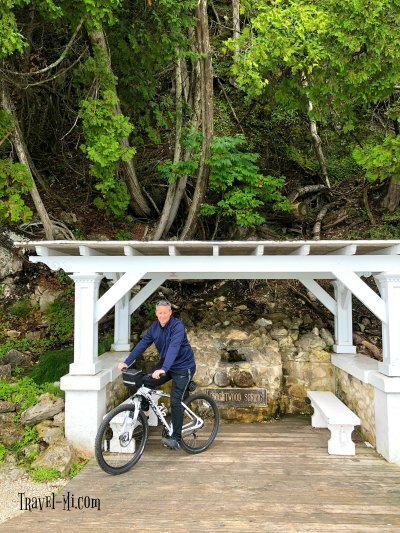 We hope you found lots of ideas of what to do on Mackinac Island! 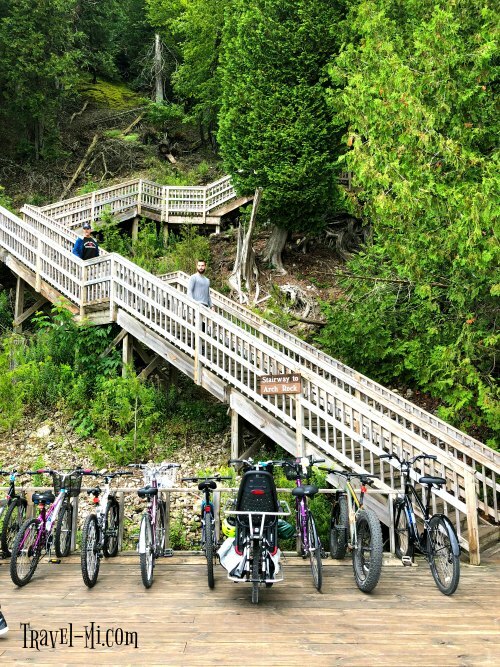 Here are more suggestions of what to do on Mackinac Island! Rent a bicycle and leisurely explore the downtown area. Bike along the island’s coast and see Arch Rock. Tip: There are less tourists along the coast if you are seeking a peaceful experience. There are 70 miles of trails waiting for you to explore! Play 18 holes on The Jewel. 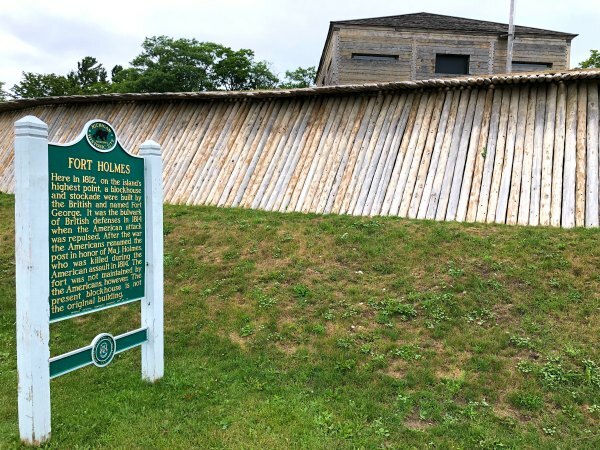 Discover history at Fort Mackinac and experience the cannon firing! Grand Luncheon Buffet in the Main Dining Room. Don't want to walk or bike? Experience the island’s history and charm with a Mackinac Island Carriage Tour. Afternoon Tea in the Parlor of the Grand Hotel. Relax on a rocking chair on the Grand Hotel's veranda. Did you know it is the world’s longest porch? Stop by fudge shops, Arch Rock, Devil’s Kitchen and go rock collecting along the way. Visit Wings of Mackinac Butterfly Conservatory and Grand Hotel horse stables in Surrey Hills. Drive a carriage or go horseback riding! Contact Jack's Livery Stables or the Grand Hotel Stable for rental information. If you've been to the island several times and need a new experience, this is it! You'll never ask what to do on Mackinac Island again! Did you know you can rent kayaks on Mackinac Island? I mean, how cool is that? Great Turtle Kayak Tours, 7395 Main St, Mackinac Island, MI 49757, located right near the ferry landing. There is so much more to The Island than fudge and horses! 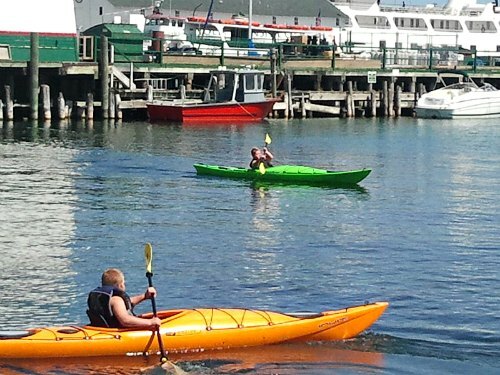 If you are wondering what to do on Mackinac Island, try kayaking!! You might love it! Great Turtle Kayak Tours offers a wide variety of exciting kayaking tours to explore in the Mackinac Island area! Try a beautiful sunrise or sunset tour. Or enter the Straits outside the East breakwall towards Arch Rock and coast over the beautiful underwater caves and rock formations of the Rock Maze. Great Turtle Kayak Tours is located on Main street just as you exit Shepler's ferry.